Lowry earns a JAM at the Golden Retriever National Specialty Qualifying!! Lowry is a thinker! She ponders and problem solves before acting so she has been fun to train so far and learns quickly. She has a lot of go and is very birdy and crazy to retrieve. She was doing 150 yard retrieves at 4 1/2 months. 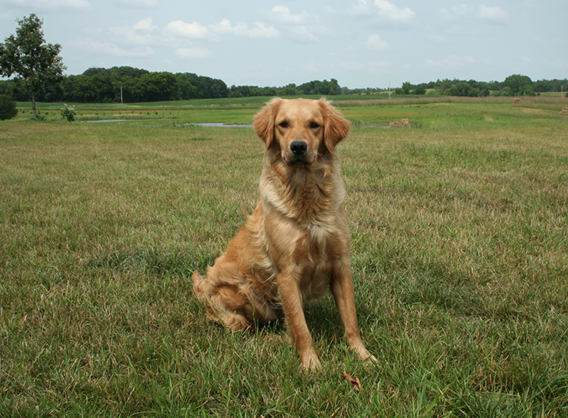 She is now finishing her Senior title and training for Master Hunt Tests and also for Qualifyings. Earns her Senior Hunter title and another Master pass at the NDRC HT in Sept. 2017. Earns her first Master pass and a Senior pass at WCMRC HT in August 2017. Earns a Senior pass at Hennepin HT in August 2017. Earns a Senior pass at Southern MN HT in May 2017. Earns a Senior pass at Rice Creek HT in May 2017. Earns a JAM in the Qualifying at the Golden Retriever Club of America National Specialty in Wilmington, OH. Earns a JAM in the Derby at the MFTA Field Trial. It was her third Derby. 2013 GRCA National Specialty Puppy JAM at 4 1/2 months.